Discussion in 'Previous Chapter Discussions' started by Mr. Kishido, Oct 26, 2018. LogicoftheVI, Vasile911, Sunita and 38 others like this. 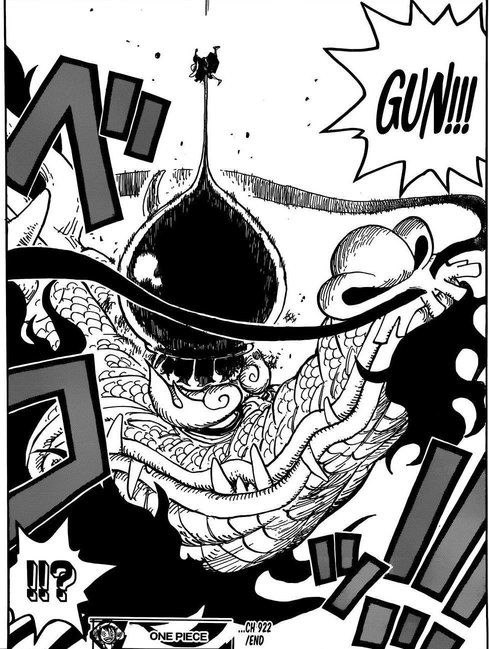 Before people say Kaido took an L.
Kaido, was drunk, offgaurd, and tank a g3 elphant gun straight on, in which none in the series has done. I mean what where we to expect, Luffy to seat calm and do nothing after knowing what Kaido did to Wano? And if you actually think Kaido is getting hurt by that, remember when he fell from sky island with no damage. Terrence d luffy, Kuroh, Started From D. Bottom and 69 others like this. 1000% sure you copy pasta'd that. No way you typed all that so fast. Filos, Started From D. Bottom, shamoland and 35 others like this. Never in my life did I imagine Luffy and Kaido's first meeting to be something like that. Kuroh, YonkoShanks, shamoland and 54 others like this. YonkoShanks, aceforlife2107, shamoland and 32 others like this. How op is garp that he could fight against a crew with both these monsters in it as well a captain. Garp must be most op in the whole of one piece. Adrenazixe, Started From D. Bottom, Lawrence Newgate and 37 others like this. YonkoShanks, Surgeon of Death, Sorous and 18 others like this. Kingofthebongo, Awakening_coming, Coquet and 6 others like this. Kaido didn’t take an L idc what anyone says. Trafalgar Deez nuts, Cpt., Cpt-Luffy and 14 others like this. Veljko, Draco, Misle D Dawn and 33 others like this. Poor Jack all bandaged up like a certain someone huh? SavegeHoakage45, shamoland, YonkouBuggy and 26 others like this. Byakuya21, aceforlife2107, highflying and 39 others like this. First of all: Holdem os back in the building!!! Kuroh, Portgas D., shamoland and 39 others like this. Roronoa Perona, YonkoShanks, aceforlife2107 and 40 others like this. So it seems like Shutenmaru actually faced off against Kaido in the past, first he cuts Jack and now it's been revealed that he fought a Yonko. Alright this guy is just getting more and more cooler, and I like how he doesn't care that Kaido is confronting him. Hero Sanji, Portgas D., aceforlife2107 and 40 others like this. So Kaido was making weapons and Doflamingo was buying them? That means that they have technology in Wano for an all out war. Franky has his work cut out of him. This just means a bigger war then. Surgeon of Death, Misle D Dawn, Sorous and 29 others like this. Elephant Gun is a big attack, and Kaidou is caught off-guard. I won't be surprised if Kaidou is knocked-out for a bit. He didn't see the attack coming and is practically defenseless. Most of all, it is an attack to the head. It doesn't matter if Kaidou's skin is hard, that attack will still rock his brains. Well, I won't discount that the attack may just tickle him as Kaidou and dragons are still an open-book in the OP universe. If that's the case, then Kaido is a monster, and Oda has a huge problem on how to make Luffy's win against him in the future credible. highflying, Surgeon of Death, france95 and 10 others like this. Hiken_no_Esu, SSsagemode, Munshi and 41 others like this. RobertoTheOharaSurvivor, Smileyman and mab07 like this. Awaken Fruit, Kuroshika, Misle D Dawn and 21 others like this.